Here Today AND Tomorrow: Part VI - Social Entrepreneurs, Inc.
How are you feeling? Have you started your plan yet? Or maybe you are anxiously awaiting each of our posts to get the full picture before putting pen to paper. We recognize that planning for the future can be challenging and hope that as you’ve followed along your confidence has grown about how you can create a sustainable organization for those you serve, your employees, and your community. Part VI in our series is about adapting to changing conditions. You may have noticed that SEI takes a strengths-based approach to our work. Focusing on strengths is critical when tackling this essential element of sustainability. 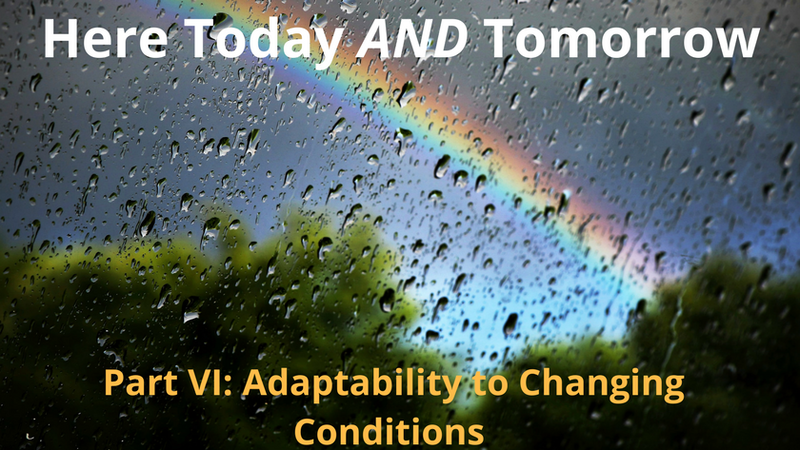 Adaptability to changing conditions is required in order to be here today and tomorrow. In the framework used by SEI, adaptability is described as maintaining flexibility to change strategies, services, systems, etc. over time without losing sight of the end result. Take advantage of various opportunities. Make adjustments necessary to overcome external threats that could obstruct the organization’s ability to achieve its mission. Be innovative in their approach to achieving their mission. In order to develop strategies for being adaptable, you’ll need to look outside your organization to monitor trends, and internally, you’ll want to analyze information and data, where available, to develop structured processes for identifying new information and making key decisions. One strengths-based approach to developing strategies is to use Appreciative Inquiry (AI) to translate past success into the ability to adapt to changing conditions, and ultimately to future success. Dissect your past successes. What was at the heart of those successes? With adaptability as your focus, or “topic” in AI lingo, engage members of your organization in story telling about a time when the organization was able to adapt. Probe deeply into the stories each person tells about adaptability. What made you, or the organization as a whole, realize you needed to make changes in the past? What was happening in the internal and external environment at the time? Were there sources of data you were monitoring on a regular basis to know when it was time to make change? Did information come from members of your team providing direct service? If so, then maybe one of your strategies might be to engage those team members on a regular basis to mine what they are learning as they do their work. Use these stories and the answers to deeper questions to document the conditions or best practices that support adaptability. Think about how these conditions serve the organization, and then develop three to five strategies for strengthening your organization’s adaptability. Adapted from Cooperrider, D.L. and Whitney, D. (2005). Appreciative Inquiry: A Positive Revolution in Change. Harvard Business Review called adaptability the new competitive advantage. If you work in the human services field in either a nonprofit or government agency, you may not think of being competitive as something you strive for, but when it comes to adaptability you’re really competing with your best, with what you’ve done in the past or might currently be doing that has allowed you to change with the times. Change is inevitable and planning is essential. You may not have all the answers about what the future will bring, but that doesn’t mean you can’t start developing and documenting strategies today that allow you to be flexible, agile, and prepared for what may come.